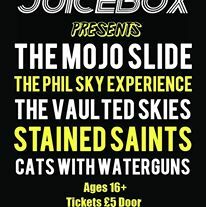 Juicebox presents 5 great new acts at Bedford Esquires, short-listed as one of the UKs Best Small Music venues! This is the start of a monthly Friday night in Holy Molys featuring some of the best local bands to have played on Juicebox Live showcase nights. Formed in late 2011, The Mojo Slide is a group of musicians united in their passion for blues inspired alternative music. Hailing from Cambridge in the UK, they write their own music and play a mixture of classic rock ‘n’ roll, blues/rock and blues rooted alternative, reimagined for the modern era. The Mojo Slide formed in a very 21st century way (via the Internet) to write some of the hardest hitting early 20th century rooted music together. In their first rehearsal, Mike (lead guitar) and Mark (lead vocals) wrote 4 songs in an hour, and this prolific writing and thirst for blues-rock continues to this day.